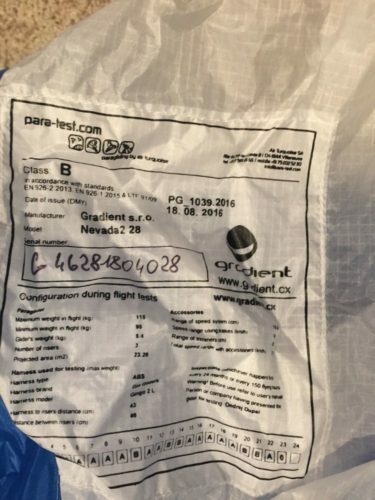 Home » Paragliders » EN B » New, never flown Gradient Nevada 2 (L) 95-115kg. Crispy and like new. This is a Large, Lime Green, Gradient Nevada 2. This is a high B, XC oriented wing for 95-115kg. It has never been flown. It has been kited a couple of times, but other than an hour or so, it has zero UV exposure. 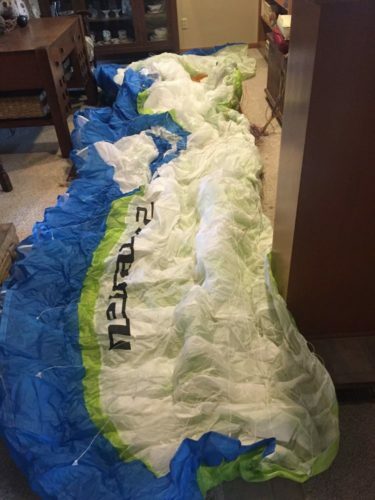 Perfect condition (nice, slick, and crispy), and includes manual, replacement fabric sheets, backpack, and small Gradient wing bag for extended storage. Everything that came with the wing when I purchased it from a dealer. Selling due to weight change.